“Oliver, where are you? You’ve been in Ascension for hours, get yourself down here before I freak,” I read from my phone, hastily packing my bags and rushing out of the silent hall of wood and stained glass windows, trying not to distract the faces beside me. I was so lost in Albert Camus’ “The Fall” that I’d forgotten about my plans to decompress. But Elijah, the singer in our punk band, The Agenda, wouldn’t let that happen. I broke my own rule, deciding to listen to some Marvin Gaye on my way, hoping to feel inspired. The weightless snow outside fell on my shoulders and backpack as I trekked across a dark and silent Middle Path, but I only noticed this once I hung up my coat in the Horn Gallery. On the upper level were the familiar Fools on the Hill improv comedy group, who smiled and waved at me as I passed, knowing what they were in for upon my arrival. They had endured numerous overlapping rehearsals with our band. Maybe they were relieving finals pressure as well. I rushed down the stairs, past the decorated walls of graffiti and posters displaying the Horn Gallery’s previous visitors over the years, including this year’s performances by Jonathan Richman and JPEGMAFIA, or Frankie Cosmos in 2015. Everybody thinks we’re wrong/Who are they to judge us/Simply because we wear our hair long, Marvin sings, just before I take out my earbuds. I now could hear them beginning without me; Shane was tuning his bass and Logan was setting up the PA system. I was wrong to think they, too, were studying for their finals. I had been part of the band for several months now, our first show being at Halloween, and our next on the coming Valentine’s Day. 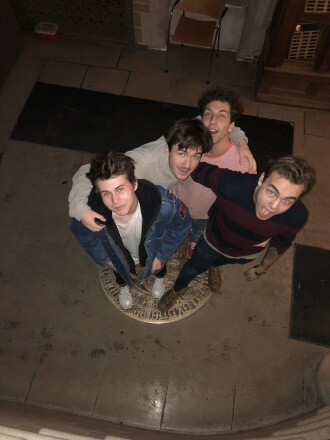 In December we did an interview for the Kenyon Thrill, and more recently we received an offer from one of the Kenyon campus safety officers to play a night at one of the local bars in Mount Vernon. But as of now we’re sticking with Kenyon venues. I met Eli Haberberg and Elijah Newman at a Horn Gallery Committee meeting, after they berated me for not cuffing my jeans well enough. At the next meeting they asked me if I wanted to contribute to the band they were forming. That night I received a text from an unknown number in a group chat titled Chocolate for Dogs, reading “Who’s game for a Saturday rehearsal?” Despite not playing the drums since elementary school, my curiosity overcame my lack of musical abilities for the time being. Currently between names, we were formerly known as Chocolate for Dogs, Rutherford Behave, Jack’s Friend’s Band, and Wholesome. But at this point we were, and still are, just The Agenda, because everyone agreed it was punk enough. We’re still open to recommendations. 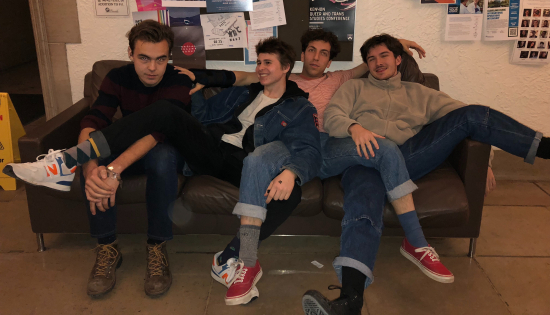 The constantly evolving band name only reflects the way we want to represent ourselves to Kenyon audiences and fit in to the greater music scene of the community. College freshmen will often encounter this problem of self-representation as individuals; but I am lucky enough to experience it in the company of my closest friends. Between the acoustic walls of the secluded Horn Gallery practice room is where I’ve discovered my first sense of purpose at Kenyon. Some join fraternities and sororities, others will be found in Rosse Hall performing with their a cappella groups. I myself even joined the rugby team during fall semester, as I wrote about previously. But these are only answers to the hardest question in college, which is how to fit into a world that we are unfamiliar with. The endless ways to find purpose at Kenyon lead to the eventual discovery of ourselves, and there is no need to rush. I closed the door behind me, sliding into my drum seat. My sticks awaited me. In the practice room I feel essential, along with each of the other three members. And I’m not that great, but to us I am, and that level of understanding between best friends is something only attainable through the sweet sound of Stooges’ and Misfits’ covers.